Charismatic, driven and dedicated - Professor Jose Ramon Nunez works tirelessly as the transplant co-ordinator at the San Carlos hospital in Madrid. This surgeon is part of an extraordinary national network of doctors trained to identify potential organ donors and speak to bereaved families in the midst of grieving. 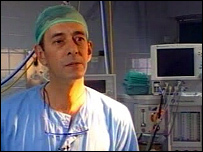 It is their skill and focus which has helped create an organ donor system in Spain which is a world leader. As we talked at San Carlos hospital, a call came in from an ambulance crew identifying a potential donor. Every effort was continuing to save the life of a woman with sudden heart failure, but it looked as though she wouldn't pull through. Within minutes, Professor Nunez changed from his suit into blue surgical scrubs. Ten minutes later another call, the heart had been restarted and the patient stabilised. The alert was over. It was a brief insight into the pressure of a job where the reality of death and the urgency of saving lives come right up against each other. Around the clock, Jose Ramon Nunez or one of his colleagues are on call. In many ways he's typical of the transplant co-ordinators who work in every hospital in Spain. As an experienced surgeon he commands respect and is able to work closely with colleagues in intensive care to identify patients whose death may become inevitable. A quiet room away from the hospital wards is set aside for families who need the privacy and time to grieve. Professor Nunez and his colleagues spend hours listening to bereaved relatives and asking them to consider organ donation. When a patient is declared brain dead and their body is only artificially sustained by machines the dialogue begins. This is the case with the majority of eventual organ donors in Spain. "I remember a case a few years ago when we spent 18 hours talking to the family," says Professor Nunez. "Of course you're not with them all the time, you let them think and go back an hour or so later. "We need to be very clear with them about the importance of the decision they're going to make - another life may depend on them saying yes or saying no." At the San Carlos hospital the refusal rate for families last year was just 3%, a testament to the skill of the co-ordinators. It is not hard to see why this charismatic, persuasive surgeon is so successful in recruiting donors. Jose Ramon Nunez knows as a surgeon that transplants can offer years of extra life to another patient. He is prepared to ask families to donate even in the case of sudden death where there can be only hours to make the decision. In one case, the police stopped a coach travelling to Madrid which had on board the only relative of a potential donor. Professor Nunez spoke to him via a police mobile phone and organ donation was agreed. "It's amazing that families say yes even in such tragic and dramatic circumstances," he says. "I think they have a feeling of generosity and of being able to do something that's good"
Spain has 35 organ donors for every million people in its population - that is three times the UK rate of 12.9 per million. While the law presumes consent, the doctor who set up their system says in practice families are always asked for consent. Dr Rafael Matesanz has no doubt that it is the appointment of dedicated transplant co-ordinators already working as doctors in hospitals which has made the difference. "During the early 1990s we had a 30% refusal rate, at the moment it's about 15%," Dr Matesanz says. "Many countries try to increase organ donation through legislation. But a change to presumed consent doesn't improve the donation rate". He points to Rioja, a small region of Spain in terms of its population. Seven years ago it was languishing behind many other regions in organ donation. In 2003 a new transplant co-ordinator was appointed and the change has been quite remarkable. This individual doctor has galvanised the regional hospital to such an extent that last year they had the equivalent of 74 donors per million population, double the already high Spanish national level. Dr Matesanz sees no reason why the Spanish system could not be copied with equal success in other countries including the UK. "We know that in 2005, 45 British people died in Spain, 45 families were approached and said yes. "So while the family refusal rate in the UK is 40%, for British people in Spain it is zero."